Happy New Year!! There have been quite a fair share of resolution blog entries covering the realm of things like weight loss, financial freedom, education, etc. I think it’s great to see what everyone else hopes to accomplish in the coming year. Writing things down is a great way to make yourself accountable for what you say you resolve to do. You can always look back on that blog post to remind yourself of either how far you’ve come or how far you still have left to go. For example, my brother-in-law and sister set out on 1/2/11 on the typical weight loss journey. Jerry started out by changing his recipes to be healthier and in smaller portions. He started working out using first a hand-me-down treadmill then a new elliptical and a weight machine Matt and I gave them for Christmas. My sister, Erin, stuck with her gym membership and went along with Jerry’s meal plan. 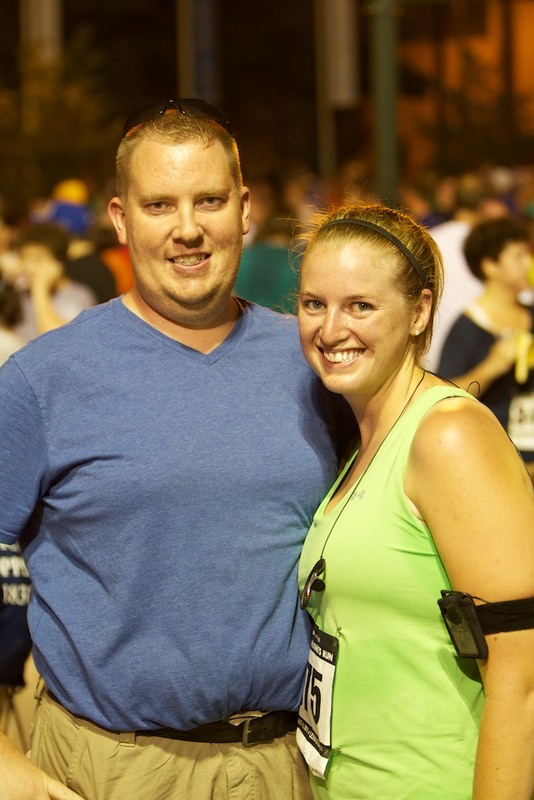 I’m proud to say that 364 days later my sister is at least 40 pounds lighter and my brother-in-law is at least 100 pounds lighter, and they competed in their first 5K on 12/31/11. How amazing is that?? I’m so, so proud of them. Sure they didn’t finish towards the front, but they finished…and they weren’t last…and they are both proud of themselves. Both of them still have more weight to lose, but they’ve come so far that it showed how this is more than just a typical resolution, but a change in their lives for the better. 2012 Goals: Career and fitness satisfaction, agility achievements, and wedded bliss! I don’t really do “resolutions.” It’s more like I set goals for myself (sure goals are about the same as resolutions, but I feel a little less cliché saying “goal”). I try my best to look forward, and 2012 is definitely the year to do so. I’ll be celebrating five years of living in Lexington and working at my current place of employment, which is pretty good considering how much moving I did after college. I hope this is the year that I can take more of a bigger role at the office and be able to celebrate some of my work as my own. I’m also starting to freelance again, which has excited me and rejuvenated my love of journalism. I’m hoping to grow this aspect of my professional life and be organized with deadlines, sources, and payments. Speaking of payments, I’m excited to have such a wonderful person to help me with my finances in Matthew. He says that this summer we should both be debt free, minus our auto payments, which was his goal before we got married. How exciting is that!? After all the credit cards are paid off, I may only use a credit card once a month or less just to fill my truck’s gas tank…only to be able to pay it off that month. Of course I have some fitness goals for 2012. Last summer I ended up losing 14 pounds, which was perfect for choosing my wedding dress. I’m at the lowest I have weighed in a long time, but I know I need to lose a few more pounds (5-10) to be at the typical “healthy weight” for my height. Plus I want to be sure that that darn dress will zip up easily and that I will look my best! I want to start toning my body more–my legs are pretty darn toned (and for someone who doesn’t wear skirts, I never really show them off), but my arms need more toning, as well as my core. And, of course, I will be running in my first half-marathon at the end of April, so my main fitness goal is to be able to finish all 13.1 miles in less than 3 hours. I hope that this summer I’ll be able to finally accomplish my goal of running in a 10K (I know, a little small after finishing a half-marathon, right? ), so that’ll keep me motivated to keep running after April. My dog agility goals are simple–I want to get Dally qualified for the 2013 AKC National Agility Championships in Tulsa, Okla. We qualified for the 2012 Championships, but they’re in Reno, Nevada, in March, which is exciting but very hard to go to participate. I can’t afford to fly Dally and myself out there, plus get a rental car and hotel room, and driving the 31+ hours because I would have to take off a lot of time from work, which won’t work very well since I have to take quite a few days off for the wedding and honeymoon in October. So, I’m hoping we can earn the six double “Qs” (called “QQs”) and 400 speed points (1 point for every second under the standard course time)…and do all of this in a limited agility schedule, since I have to cut back for the wedding. And, of course, there’s the wedding that’s been hinted at throughout this blog post. I’m excited to start seriously planning the wedding the early part of the year and then enjoying every moment leading up to it. I do not want to be one of those “bridezillas” and I want to be able to enjoy things with my family and friends. I know it’s more about the marriage and the time after the wedding than the actual day itself, and I hope we can keep that in mind. I can’t wait to continue growing with Matt in more ways than just in age and solidifying our happy little family. What are your goals/resolutions for 2012? Whatever they are, best of luck and stick with them!! This entry was posted in Dogs, Healthy eating, Running, wedding, Workouts and tagged Dog agility, Goals, Health, New Year, Weight loss by Megan. Bookmark the permalink.